Kathy Smith has stood at the forefront of the fitness and health industries for more than 30 years. With a collection of best-selling books, videos, audios and DVDs on walking, strength training, yoga, Pilates, dance, aerobics and nutrition, Smith has sold over $500 million in lifestyle products and fitness equipment. Kathy Smith has impacted millions of lives throughout her career. She pioneered the fitness movement by releasing the first fitness videos to the marketplace and she has been serving the boomer generation for over 30 years. Kathy decided it was time to start connecting with new audiences by using a new channel, Facebook, to build her email list. 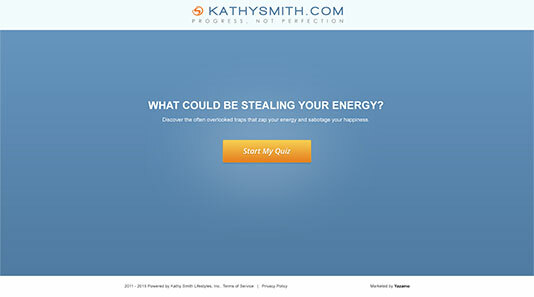 Kathy Smith created a quiz to help women understand why they were potentially having lower energy levels. Her quiz was then advertised on Facebook. Once someone clicked the ad, they were given 12 questions to answer about their energy and habits. After they answered all the questions, they were asked to opt-in with their name and email and were told what was potentially causing them to have low energy. Kathy Smith found that by using LeadQuizzes and Facebook advertising, she was able to reach new audiences of boomers and inspire them to be the best they can be. With her quiz, she was able to engage them in a fun way at a very inexpensive cost per lead. Because of the cost per lead, Kathy was able to provide her customer with quality video content to serve them better.